Katma is lead by Katrine M. E. Strøm (1977) from Andøya in the northern part of Norway. Katma creates interactive performances for children. In 2008 Katma received an award from the performing arts hub Norway (PAHN) for creating groundbreaking, challenging and visual performances for children. The interactive performance ”Usynlig” (invisible) won an award for best DKS production in 2010. Katrine was in 2008 the youngest Artist in residence at The arts festival in Northern Norway where she presented the performances Rust, Wonder Chamber and Not for sale. So far, the highlights in her career are Mørkemodig, Mørkemodig is about all the beautiful things that only appear when it is dark. "Bakeriet"- a performance that shows us what might happen when we have been alone for a long, long time, "Usynlig"- a visual and auditory journey through the library of Tromsø. "Rust", about the longing for being a beloved child and ”Wonder Chamber”, an experimental labyrinth for children. For many years, she has worked with and alongside children and young people. With TK'81 she has produced fifteen children's performances with as much as 55 actors on stage. 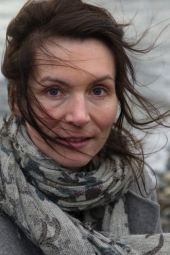 In addition she is also the artistic director of Lille Hålogaland teater in Tromsø.